All About Virtual Reality is a book for young readers that not only explains the basics of virtual reality (VR) but also allows them to explore it first hand, thanks to the engaging app designed by Curiscope. As you read through the book there are trackers that need to be scanned by your smart phone in order to explore the digital VR. The book is quite short, but covers things including how the VR models were created; a little background on the history of some of the VR places you'll be visiting; a look at how VR can be improved on in the future to include a truly immersive interactive experience; and how VR is currently being used today by doctors, to train pilots, and for fun fashion wear. There is also sheets of cardboard which have been scored and cut, which enable you to make your own VR viewer (although you will need a smartphone in order to download and watch the videos) to ensure you get the full VR effect. And there are also a selection of cool and fun stickers to customise your headset. 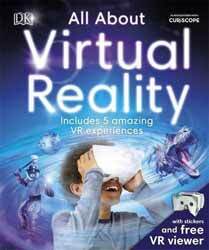 For the young interested in the future of gaming and entertainment, All About Virtual Reality is an interesting and informative guide that allows you to explore 5 custom made VR experiences.